This example demonstrates how you can use the QUANTSELECT procedure to select covariate effects for quantile regression. The data set under investigation contains salary and performance information for Major League Baseball (MLB) players, excluding pitchers, who played at least one game in both the 1986 and 1987 seasons. The salaries (Time Inc., 1987) are for the 1987 season, and the performance measures are from 1986 (Reichler, 1987). nAtBat="Times at Bat in 1986"
yrMajor="Years in the Major Leagues"
League="League at the end of 1986"
Division="Division at the end of 1986"
Team="Team at the end of 1986"
American East Cleveland C 446 33 20 . The SELECTION=LASSO(ADAPTIVE) option in the MODEL statement specifies the adaptive LASSO method (Zou, 2006), which controls the effect selection process. The STOP=AIC option specifies that Akaike’s information criterion (AIC) be used to determine the stopping condition. The CHOOSE=SBC option specifies that the Schwarz Bayesian information criterion (SBC) be used to determine the final selected model. The SH= option specifies the number of stop horizons, which requests that the selection process be stopped whenever the STOP= criterion values at step are worse than those for step s for some . Figure 78.1 shows the “Model Information” table, which indicates the effect selection settings. You can see that the default quantile type is single level, so this effect selection is effective only for . Figure 78.2 summarizes the effect selection process, which starts with an intercept-only model at step 0. 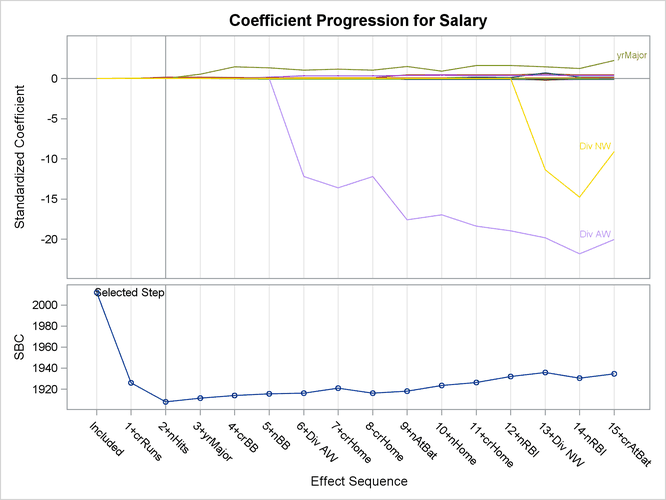 At step 1, the effect that corresponds to the career runs is added to the model that reduced the AIC value from 2691.6511 to 2510.7297. You can see that step 10 has the minimum AIC and that step 7 has the minimum SBC. Common sense also tells you that the SBC favors a smaller model than the AIC. Figure 78.3 shows that the selection process stopped at a local minimum of the STOP= criterion, which is step 10. 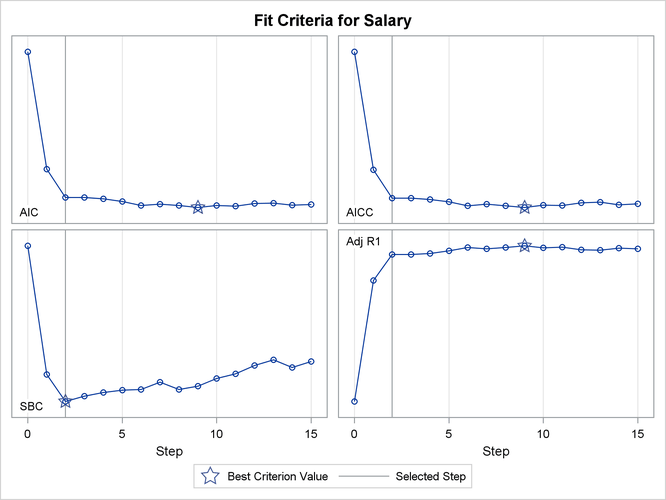 According to the SH=7 option, the effect selection process is stopped at step 10 because all the AIC values for step 11 through step 17 are no less than the AIC at step 10. Step 17 is ignored in the selection summary table because it is the last step. Figure 78.4 shows how the final selected model is determined. CHOOSE=SBC is specified in this example, so the model at step 7 is chosen as the final selected model. The model at step 7 is selected where SBC is 2473.62. Figure 78.5 shows the final selected effects and Figure 78.6 shows the parameter estimates for the final selected model. Figure 78.7 shows the effect selection summary with . Figure 78.8 shows the parameter estimates for the final selected model with . You can see from Figure 78.8 that low-end salaries for MLB players depend mainly on career runs and hits in 1986. Figure 78.9 shows the effect selection summary with . Figure 78.10 shows the parameter estimates for the final selected model with . Figure 78.11 shows the progression of the parameter estimates as the selection process proceeds. 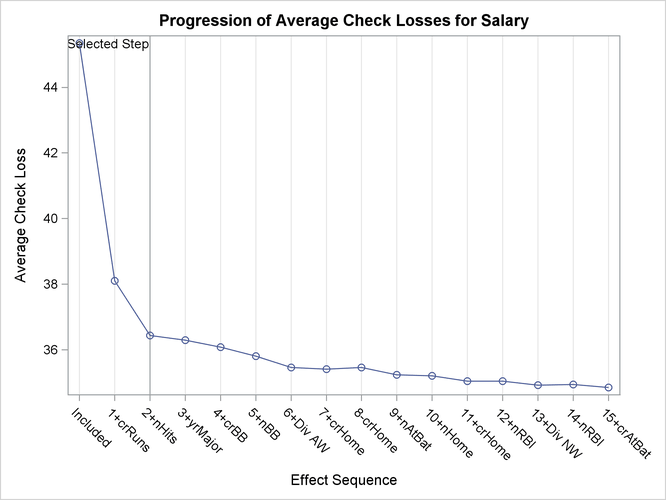 Figure 78.12 shows the progression of the average check losses as the selection process proceeds. Figure 78.13 shows the progression of four effect selection criteria as the selection process proceeds.